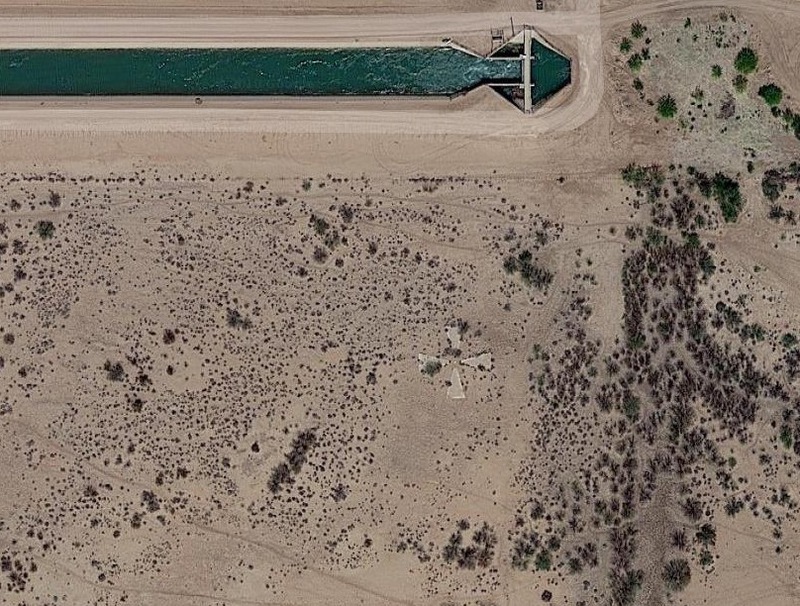 Often we find ourselves looking for interesting places to explore by using a mapping app or website in satellite view. Sometimes we come across an item or area that peaks our interest but is unlabeled and a mystery. I hate unsolved mysteries and so throw myself into solving them by any means necessary. 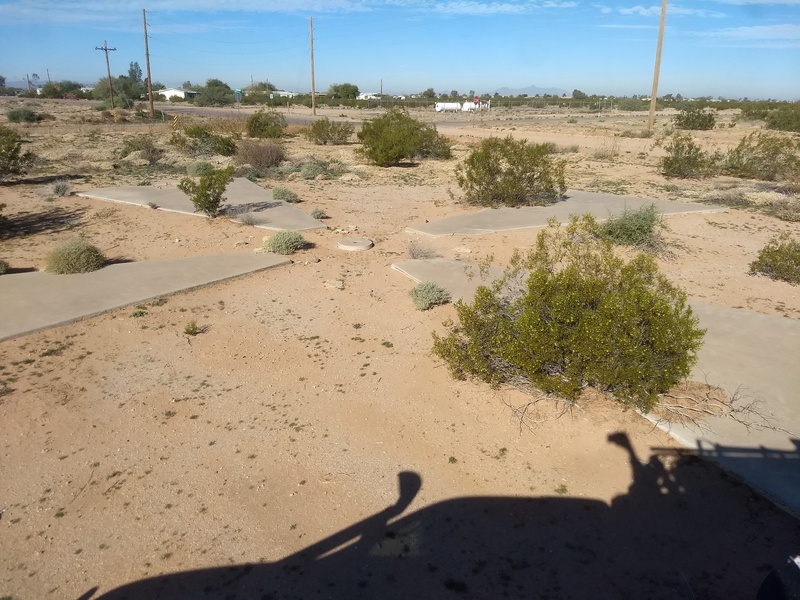 A couple of years ago while scouting the area via Google Maps we saw several obviously man-made markers in the area East of the Sonoran Desert National Monument and wondered what they were. 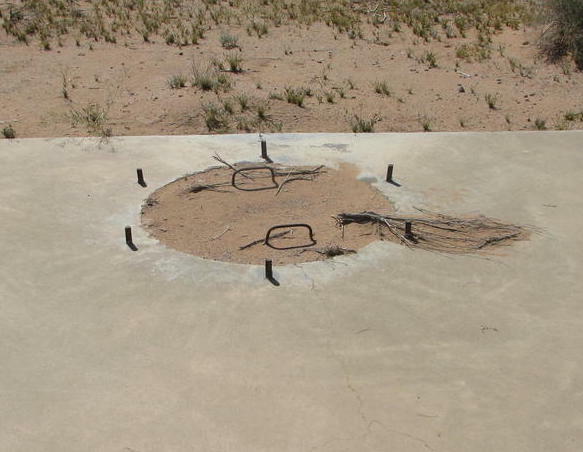 A little online research and we found out these were concrete calibration targets for the Corona Spy Satellite program. We decided to visit them just for kicks and a little Cold War history experience. We found that someone had already done a great deal of legwork by mapping the original grid and finding out which of the original targets were still visible, damaged or completely missing. The grid is essentially a 16×16 mile square with markers every mile and an additional row and column along the West and South edges intentionally placed every other mile for easy orientation when viewing from space. That gap in the middle of the blue lower left quadrant is the grid space for marker AA 56 which ended up on the side of the Silver Reef Mountains where there was no level ground and it was most likely too expensive to flatten the area before building the marker and so it was never built. There were 144 Corona Satellites launched during the program’s 13 year run between 1959 and 1972. They flew in a polar orbit and were programmed to take photos of specific areas depending on mission parameters, weather, the satellite’s operational status and if an area had already been imaged. 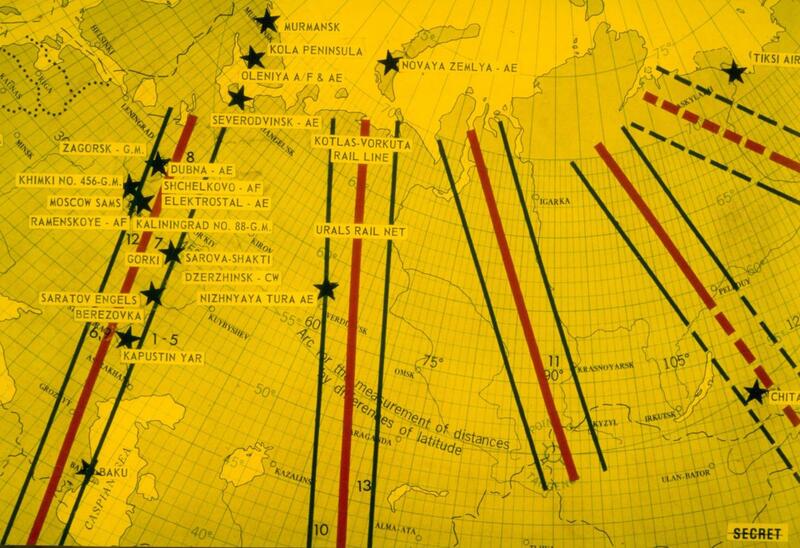 Below is an orbit plot for an unspecified Corona mission over the USSR that shows key targets. The red line is the orbital path of the satellite. The two black lines represent the maximum camera coverage on either side from the satellite’s orbital path. The program was fraught with technical problems and launch or recovery failures during its formative years and eventually the CIA decided that these targets were needed. 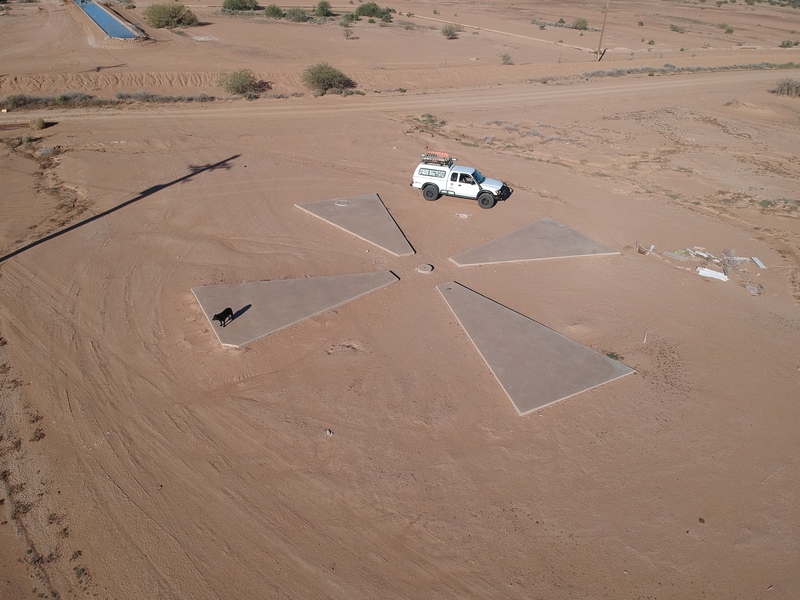 All these calibration targets were put in place between 1966 and 1967. In 1973 the first GPS satellites were launched into orbit and so the need for such old-school, visual calibration methods was made obsolete. 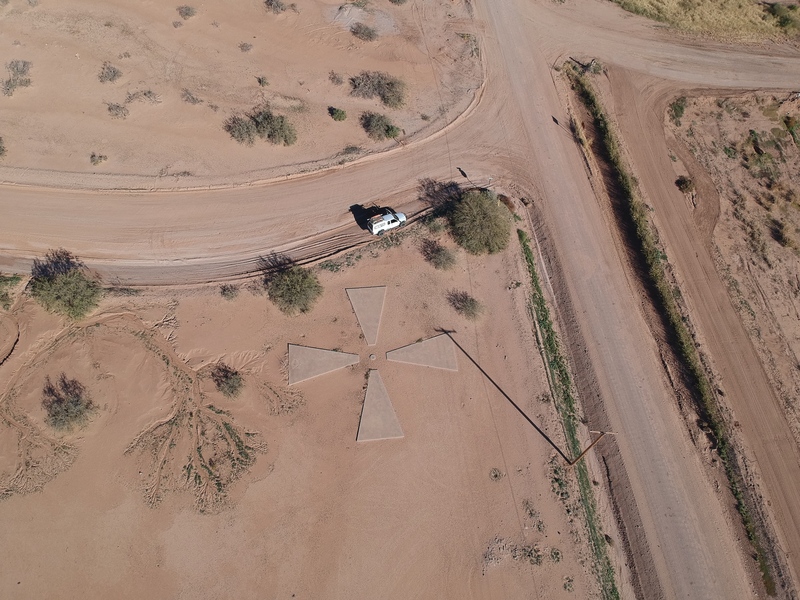 Each marker is in the shape of a simplified Maltese Cross. Each marker is 60 ft across. Individual arms are 25′ long, 16′ wide at the wide end and 2′ 8″ in width at the narrow end. At the center of each cross is a cement circle with an embedded survey marker. 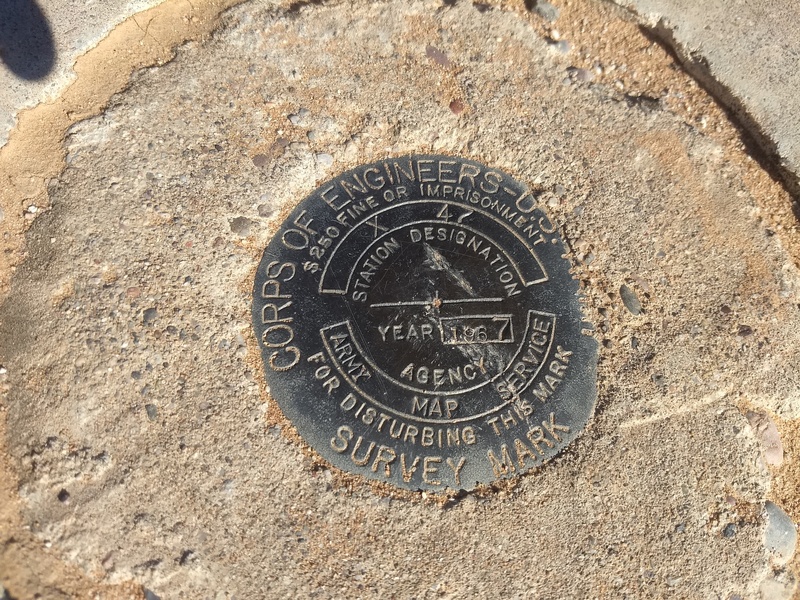 Each of the four we visited had a date of either 1966 or 1967 and the name of the agency responsible for the survey marker which in all cases was the “Army Map Service.” I have read that the survey was performed both vertically and horizontally with such extreme accuracy that it was not off by more than 2mm (which is the width of a pencil lead) at a mile! On each marker the west arm has a manhole with cement cover and rebar handles. There are 6 evenly spaced pieces of rebar around each cover poking about two inches out of the concrete. The couple we tried were too heavy to lift by hand. We debated popping one off with our winch but figured we would most likely find nothing but old garbage or dead bodies and decided to leave well enough alone. We visited four markers in a little over an hour; W 47, X 47, X 48 and W 49. Some were in pristine condition, in as good a shape as the day they were poured over 50 years ago. We took a quick video of another nicely preserved example with our DJI Spark at X 48. Others were overgrown with cracked areas and missing pieces. We also went and checked out one of the missing markers which an existing or previous landowner plowed up or the Army had removed it sometime after the program ended. 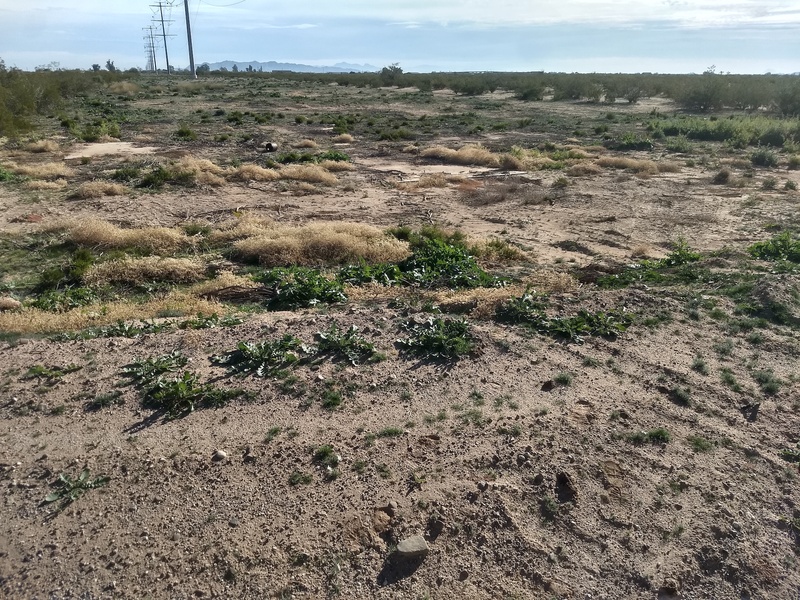 That looked like what you would expect it to look like – an overgrown and empty section of field off to the side at a corner road intersection. No picture is necessary but you can imagine the above pic of the W 47 marker with no concrete pieces in evidence. 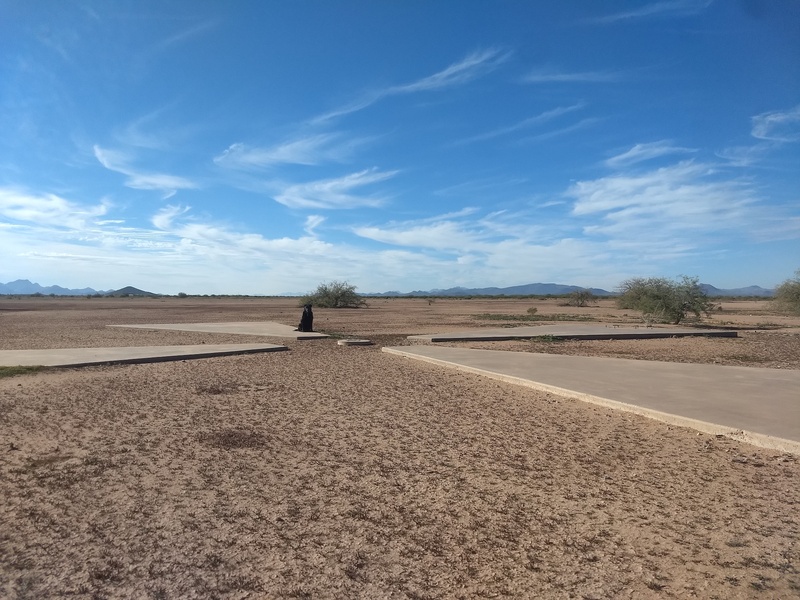 Although not a great adventure for Willow it made me happy to finally visit, figure out what those markers were and immerse myself in some Cold War technical history. Willow did get to lounge on some nice, smooth, warm concrete pads several times that morning and I am sure she got in some quality sniffing time as well so it wasn’t all bad for her. If you are really interested you can find a bunch of declassified information on the CIA website. If you find yourself in the area or are planning on visiting any of these Cold War relics you can easily find and download a .kmz file online that you can open up in Google Earth or another mapping program. Sometimes the most interesting finds start out as a mystery to be solved. This was one of those times. Have you found anything interesting and mysterious while searching on a map? Let us know about it in the comments below and have fun out there. I wish there was more to substantiate the accuracy claims. I have driven between these targets and they vary quite a bit. I’m not even sure 2mm ( I have read many that said 1mm) would be achievable with ground methods in 1967. Anybody know more? Hi Willow’s Dad. (Sorry, I can’t find your name anywhere). Over the New Years holiday I spent 4 days out at Kofa near Quartzite. I was camping with my Mom who is in the midst of a few years as a Traveler. We had a blast. She found your blog a few days ago and shared it with me. As writers ourselves we both loved your stories. Of course since we also took the same rough roads and visited the places you describe, you made all our memories come back to life. Very well done. Thanks for a good afternoon of reading enjoyment. Give Willow a pat.